Researching the little Petit Basset is quite exciting ~ as it has ancient origins in the France area of Vendee and its historical development covers over 400 years, even though it is new to the United States. Originally developed to hunt rabbits and small game, the dog was bred to be worked as one dog, two (also called a "brace," or a pack of dogs. Our PBGV's breed characteristics were fixed by Abel Desamy, a French breeder, with the Petit developed for hunting rabbits. The French were not only influential in the development and refining of the hunting hounds, but it had its start there. Not knowing much about the scientific areas of dog genes, they bred dogs that were of such high quality they are still with us today, as the hound was the first dog to have its breed type "standardized." Taking hound casual breeding (talked over at the local tavern or after dinner at a friend's home) into a science, they developed four varieties of the Griffon Vendeen. #2: Briquet Griffon--medium sized dog, measuring approximately 20-22 inches at the withers. #3: Grand Basset--smaller sized dog, measuring approximately 15-17 inches at the withers. #4: Petit Basset--smallest sized dog, measuring 13-15 inches at the shoulder. Originally developed from the white St. Hubert and the white/tan hound for the Petit Basset Griffon Vendeen, and an addition of the "King's Whie" Grand Griffon for the larger, heavier, and longer "Grand Basset Griffon Vendeen," the two hunting breeds are part of a package of four breeds, with these two being bred together up until 1975 when it became prohibited. New to the United States as a companion dog, the little Petit has been in France for almost 100 years for hunting rabbits. The official Basset Griffon Vendeen Club was formed in France around 1907, which then became known as the Club du Griffon Vendeen when all four varieties of the dog were accepted. In the United States, the P.B.G.V. Club of America was formed on November 19, 1984, with the dogs being able to compete in AKC licensed shows in 1991. The PBGV is more like a terrier-like in temperament, and Basset Hound in appearance. Their coat is wire or rough-coated and has an undercoat for protection when hunting the underbrush. It is best described as slightly medium to long in length without any exaggeration, rough textured, and harsh to the touch--with a rather "messy look" about it. This scruffy look is actually derived from the look of the long eyebrows, beard and moustache, that give the dog its unique look. The Petits are a wonderfully happy dog that is not only comical, but very mischievous. With their hound's voice and constant tail wagging, they are an irresistible dog with the most comical face on any breed. It is very hard to turn away from this cute dog, even though they are rather independent and slightly obstinate, always wanting to be in the limelight. But unless a new owner researches the breed, they may not have what they really want as this is a very dedicated breed--to hunting, digging, chasing varmints. This breed was bred to hunt in a pack, and those instincts are still very much part of the breed's standard. Highly alert and willful, it is always a charming little 'cutie with that scraggly face and heart-filled eyes. 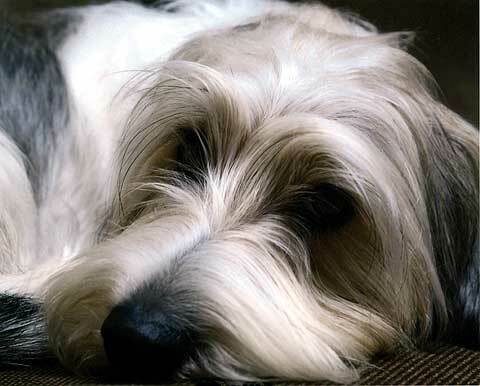 The Petit Basset Griffon Vendeen is one of the few healthy breeds with very few major diseases. Due to the type of hair on the Petit Basset Griffon Vendeen, brushing with a wire brush is almost mandatory to keep the hair clean and mat-free. Depending on the lifestyle and activity level of the dog, a good guess is two to three times a week. The ears need cleaned whenever the dog is bathed, once a month or less often, depending on the life style of the breed. The energy level and exercise requirement level for the Petit Basset Griffon Vendeen is very, very high. Not a dog for a person whose high energy peak of the day is playing games on the computer or turning channels on television, a large yard or active owner is almost mandatory along with an owner who likes to be busy. Going for walks, playing ball, jogging, hunting, and camping are excellent things to do with the little Petit Basset Griffon Vendeen. The worse nightmare for this dog is to be left unexercised and penned up for days at end, with only a minimum of human interaction. Very robust and energetic, the Petit will find a way to get out, through digging or "plowing through." If the dog cannot be attended properly to the point it becomes a dog with bad behavior or one with negative actions, finding a home with a more dedicated or active owner is the right thing to do--not only for the little dog--but for the owner. The PBGV is a hound dog, which means it hunts. Many people purchase this little dog as it is a cute little puppy and lovable looking--with very little research done on the breed and what it is about. Hunting dogs hunt (surprise!) and if left unattended or untrained, they will destroy your home and yard within minutes as it is their nature to "hunt" for things--even if it is your best Sunday morning church shoes or new sunglasses. The training of the Petit Basset Griffon Vendeen is easier than most people think, as they are not only intelligent but love to please their owners. A small, short-legged, scruffy-looking dog, this breed requires a strong upper-hand and strong obedience training, along with a definite course in leash training. This is due to the fact that the little dog refuses to lie around much and watch television, not matter how adorable and cute they looked as a puppy, and walks are usually part of their exercise, unless a very large back yard is available and an owner who is active or likes to hunt. But when out for a walk, never remove the leash and let the little dog run unless it is an intentional thing, as they will be gone in a New York minute "hunting" for something for prey, without ever looking backwards. One of the most adorable and affectionate dogs, once they understand their owner is boss, they will do anything to please them. An independent, bold, vivacious, compact, tough, and robust little dog--their spirit is wonderful to behold but they are not just for anyone to own. Unless the owner is dedicated to the breed and in strong training, combined with some type of energy level, this is not the dog for them. Part of the home life training of this little hound is a safe environment that the dog can call its own. Crate training is excellent, or some form of kennel during the day when everyone is gone, is excellent as long as they have their favorite toys and the pen is "Petit proof." The worst thing any dog owner can do is crate or pen their dogs and only take them out on an occasional basis. If so, then the dog needs to be placed in a proper home as this is a form of mental and emotional abuse, especially for this little breed. These dogs need human companionship, as most dogs do, and will literally become depressed and wither away without it, resorting to negative behavior to compensate for the loss.